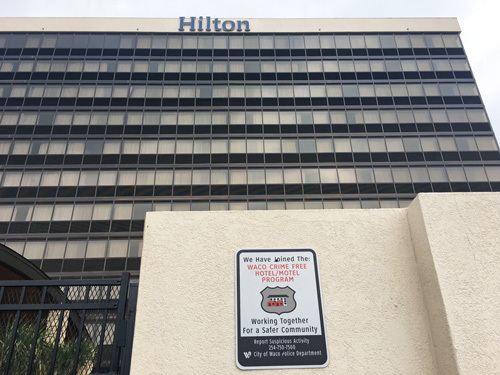 The Waco Crime Free Hotel/Motel Program is a voluntary partnership between police and leisure industry professionals designed to keep drugs and other illegal activity out of hotels and motels in our city. The Crime Free Hotel/Motel Program employs a solution oriented, three stage approach to establishing this partnership. Phase I is an owner/ management training seminar. This seminar covers all aspects of the program focusing on guest and staff safety, recognition of suspicious or criminal activity, indicators of drug use or sales, C.P.T.E.D. standards (Crime Prevention Through Environmental Design), and human trafficking. Phase II is an inspection of the hotel’s or motel’s physical security features and practices. 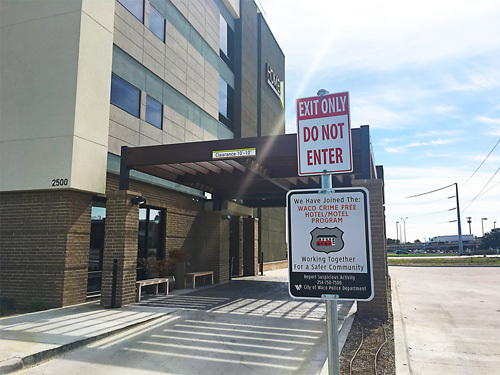 Hotels and motels must meet physical security requirements in order to become certified members of the Waco Crime Free Hotel/Motel Program. Phase III is an employee training class which covers guest and employee safety, recognition of suspicious or criminal activity, indictors of drug use or sales and human trafficking. No matter where your travels take you, you have a role in your own safety. Please take the proper precautions to make your stay enjoyable. Lock your vehicle and take all valuables with you to your room. When checking into a hotel, review the floor plan on the back of your room door to familiarize yourself with fire and emergency exits. Don’t open the door unless you know the person. If the person claims to be an employee, call the front desk and ask if they have sent someone to your room. Give your children a hotel business card to help them remember the name, address, and telephone number of the hotel where they are staying. Always lock your door using the deadbolt and latch. Secure the room connecting doors with all security devices provided by the hotel. Be mindful of who you invite to your room. Place all valuables in the deposit box or room safe. Do not leave valuables in your vehicle. If you receive a call from the front desk requesting credit card information, go to the front desk to confirm they are the ones calling you. Be wary of unsolicited business flyers left at your hotel door. Always check with hotel before placing any outside room orders that require your credit card number. When you leave, check your room’s door to ensure that it is locked. While by the pool, do not leave your room key or any valuable unattended. While staying as a guest at a hotel, do not use the secondary latch to prop your door open when leaving your room for brief periods of time. If you see something suspicious, call 254-750-7500 and the hotel management. If it is a emergency call 911.